In Japan, where customers aren’t considered kings but “gods”, the level of friendliness your employees show can make or break your business. That’s why it’s no surprise that it was a Japanese company, Omron, which was the first to develop a high-tech “smile-o-meter” [JP] in 2009 (as previously reported). 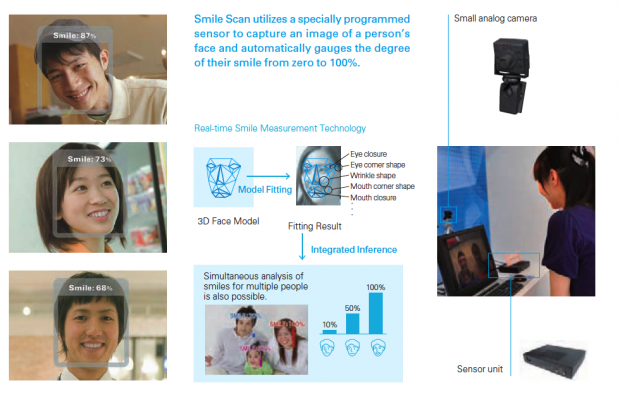 The device, dubbed Smile-Scan, analyzes the way you smile (by checking key spots like your mouth and eyes) before giving scores: a 100% score means you just showed the perfect smile, for example. It turns out the Smile-Scan was a hit with the target group (mostly the service industry), as Omron recently updated the device. It now has a video training function, which helps users to improve their smile, for example. Omron started offering the new system in Japan this week (price: $7,300). The company plans to sell a total of 200 units, but it probably won’t bring the Smile-Scan to other markets.